Pediatric Tuina. In Acup department I learn a lot about treating pain, tinnitus, facial paralysis, and insomnia with needles. Dr. Xuan Lihua, Dr. Xu Fu, Dr. Xu Yonggang and Dr. Wu Xiang in acup department really impressed me. ideas about classical theory, this is rare. The translators are good and nice, especially Nickole, Justin, Rex and Jeremy. 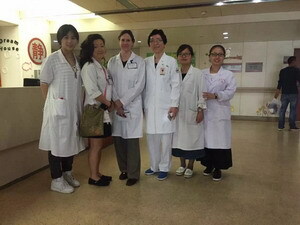 They have strong TCM basic knowledge and excellent accent that really help me a lot in the clinic. And Dr. Ge, Ms. Chen and Nickole from the International Exchange Center of Clinical TCM in the hospital started to help me figuring out everything before I came and arranged reasonable schedule. Some suggestion for the hospital: having teachers who are able and willing for foreign students teaching. It would be good to know the list of possible teachers before we arrive. good of a practitioner as he is- kind, smart and profoundly effective. kind, very clear in his communications and I learned so much on his shifts. profound, and I am so humbly honored to have had this experience. doctors/ administrators are some of the best I've met. here and study with such esteemed doctors. Based on my 7 year experience, I can wholeheartedly recommend the Zhejiang Provincial Hospital of TCM and the wonderful Dr. Ge, Ms. Chen and Ms. Cao of the Exchange Center of said hospital. I have been coming here in person, accompanying groups of students and graduates to study at this facility since 2009, and we have been sending our graduates here for over ten years. Our students spend anywhere from one to three months studying under the kind and professional guidance of the respectable doctors at the hospital. During our stay, the students get a chance to experience TCM in its truest modus operandi. Whether it is in the clinic under the kind and patient supervision of the doctors, or in the class room lectures, where we can experience the depth and truly encompassing knowledge of the professors, our students all report an amazing experience. It is extremely important for us that our students experience, first hand, the diagnostics and treatments prescribed in the various departments, and we circulate between internal medicine (Traditional Chinese herbal medicinal treatment) Acupuncture, Tuina and of course pediatrics, OB/GYN etc. Our students come away with what they say is a deep and inclusive learning experience, so no wonder many of them choose to return in the future for further studies. I would like to personally thank Dr. Ge, Ms. Chen and Ms. Cao for all the warm welcomes and tremendous help, time and time again, and thank them for all the effort spent in making our visits so productive and smooth. It is a real pleasure to cooperate with them. I would highly recommend the various programs offered by the Exchange Center at the Zhejiang Provincial Hospital of TCM to any student, graduate or even experienced practitioner. They have been and remain an important pillar in the educating of our TCM practitioners and we will certainly be returning again and again to further our knowledge. practitioner who could teach us what he knows so well. Rex was very friendly and helpful. and classroom. She is very friendly and understanding of our needs and cultural differences. cared for in all of our needs. Thank you for an amazing experience in Hangzhou! !